Kedleston Hall, Derby, owned by the National Trust has undergone restoration of the state apartment over a number of years, a very long and expensive process to restore the rooms to the former glory of 300 years previously. The last room to be restored was the state bedroom and this was described as the pinnacle of the restoration, with everything in it being returned to as near to its original as possible. There were some slight modifications but the results are stunning, and breath taking. 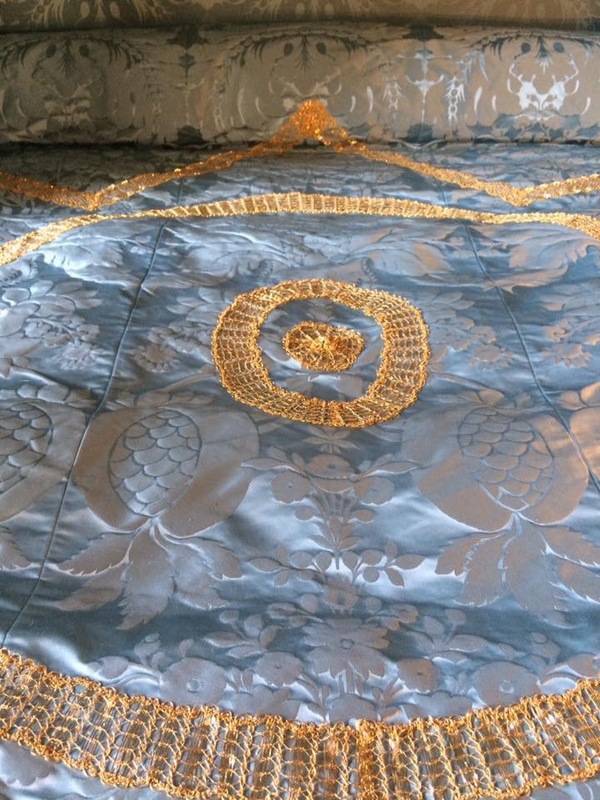 During late 2014, I was approached on behalf of National Trust to recreate the antique gold lace that was on the state bed. This lace had become very worn, discoloured and broken during it’s 300 year life and in need of replacing. Kedleston were keen to keep the lace as authentic as possible and so the first task was to study the lace in situ, taking measurements and photographs of the four designs on the old bed. This was done before the dismantling of the bed took place. (the bed was completely dismantled and taken away for restoration, a very specialist job with including renewing the ornate gilding on the mouldings of the bed. I took the measurements back to my studio and starting drafting the original designs using the latest lace design computer software, and then sampling the designs. 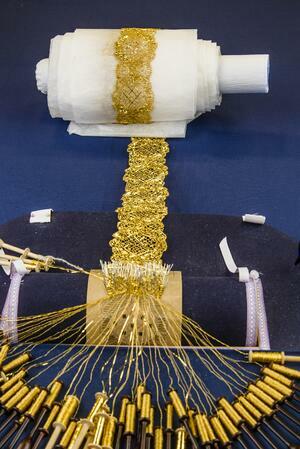 Gold thread was supplied to me, the same threads being used by Heritage Trimmings, to recreate the braids, tassels and other trimmings on the state bed. All the trimmings had to match. The gold would have originally been used to reflect all the candlelight in the room and made the bed the focus of the room. The state apartment was originally prepared in anticipation of a state visit but unfortunately Kedleston never received one! Once the samples had been made, working diagrams for the lace prepared and the designs accepted by the restoration committee, I was given the go ahead to start making the lace in early 2015. One of the designs, the one that is now displayed on the bed canopy, overhead at high level, took around 52 hours a metre to make, and 11 metres was required of this lace. The two other designs on the bedspread, 11 metres was made of one design and took around 26 hours a metre and the third one, 8 metres was made at around 24 hours a metre. A huge amount of time involved, worked over almost 2 years. 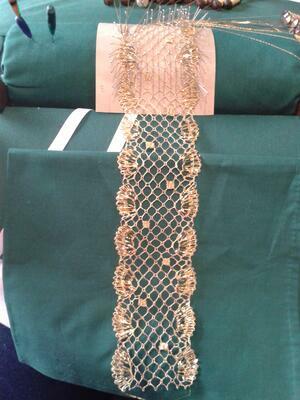 The techniques of bobbin lace with metallic gold thread, wound onto bobbins, were worked using the traditions of 300 years ago, and while slight adjustments were made in one of the designs, with thoughts to future conservation, the designs looked as original as they would have done 3 centuries earlier. 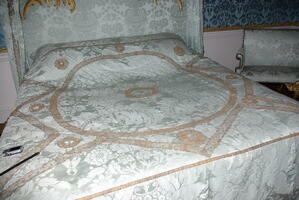 The lace is now permanently installed on the recreated bed for the future generations to enjoy. Many specialist crafts people were involved in this restoration, specialists in their own fields, coming together under the umbrella of the National Trust to show we still have the skills today to recreate the stunning work, and protect the history and heritage of this important jewel in Derby’s crown.